** (3) Rooms Available at the discounted conference rate. 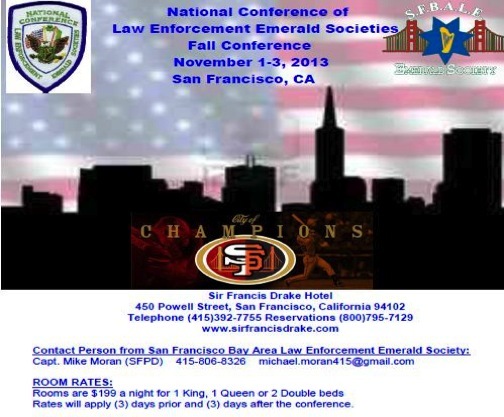 SFBALEES WILL BE PROVIDING TRANSPORTATION FROM SFO TO THE SIR FRANCIS DRAKE FOR NCLEES EXECUTIVE BOARD ONLY. ** Following the reception SFBALEES will buy a few rounds for conference attendees and their guests at The Irish Bank (10 Mark Lane, near Bush/Grant) which is walking distance from Hotel. at 9AM in front of the Sir Francis Drake Hotel. Buena Vista (2765 Hyde St (@ Beach) for their famous Irish Coffees! SFBALEES will provide a hot lunch for all delegates. Wives & Girlfriends during the conference. Meet in the hotel lobby at 10AM. where we will stay until closing time.